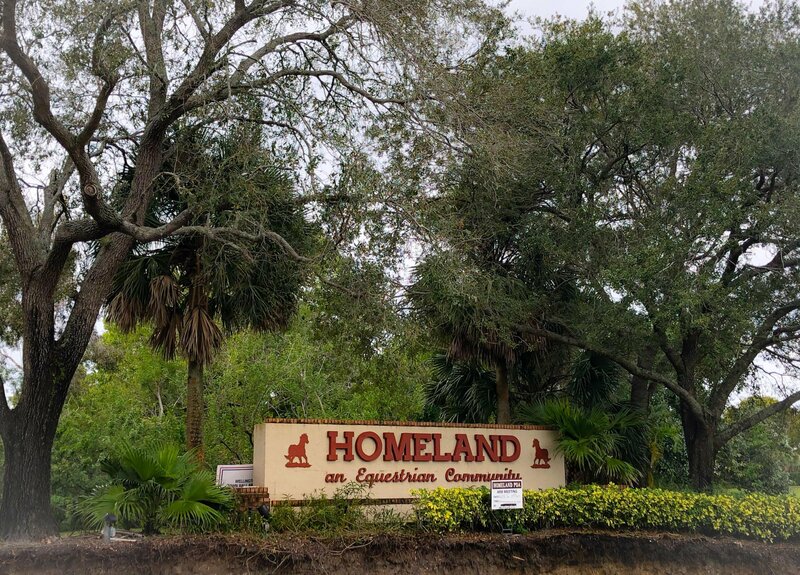 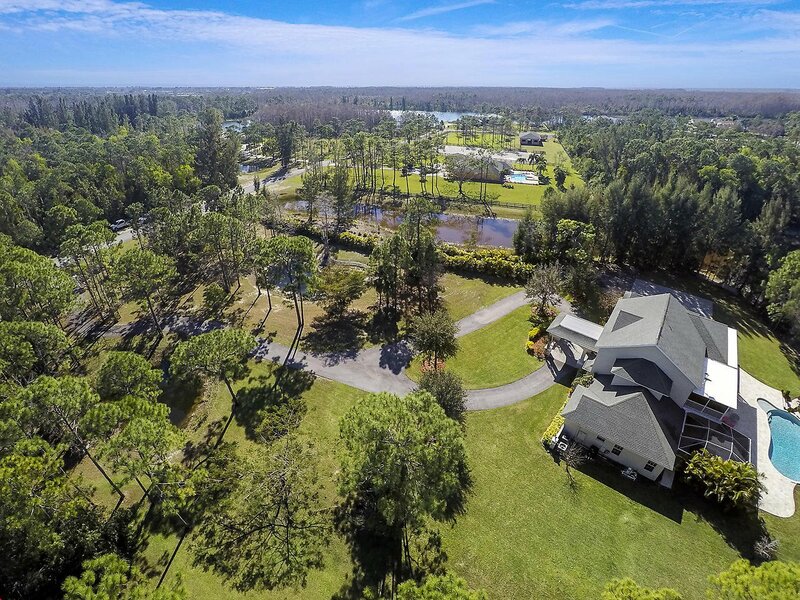 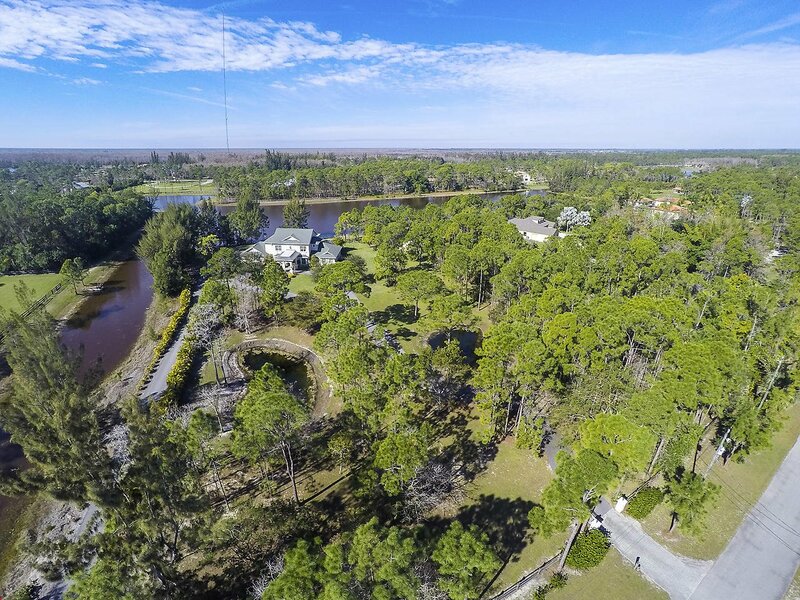 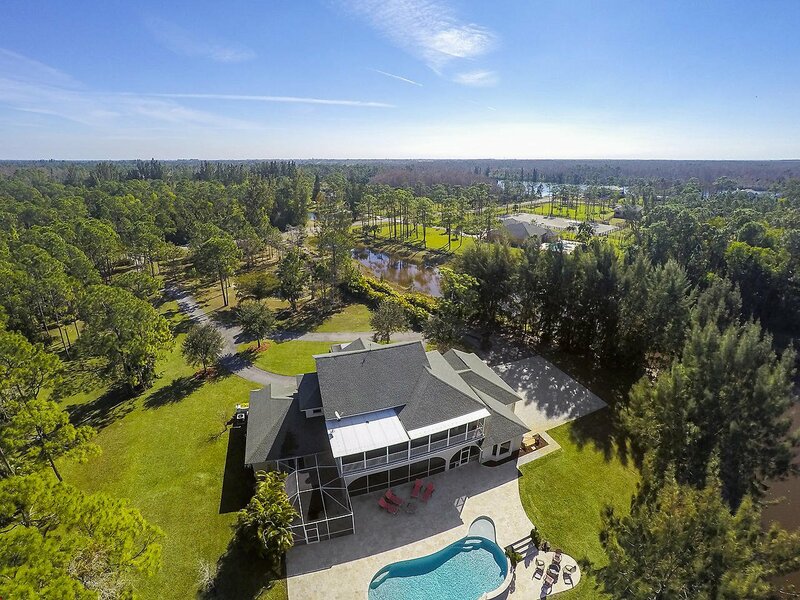 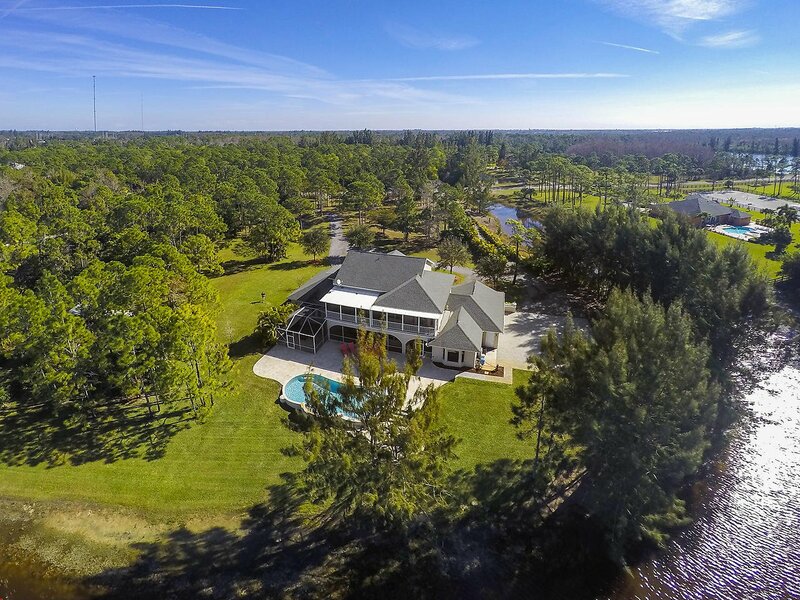 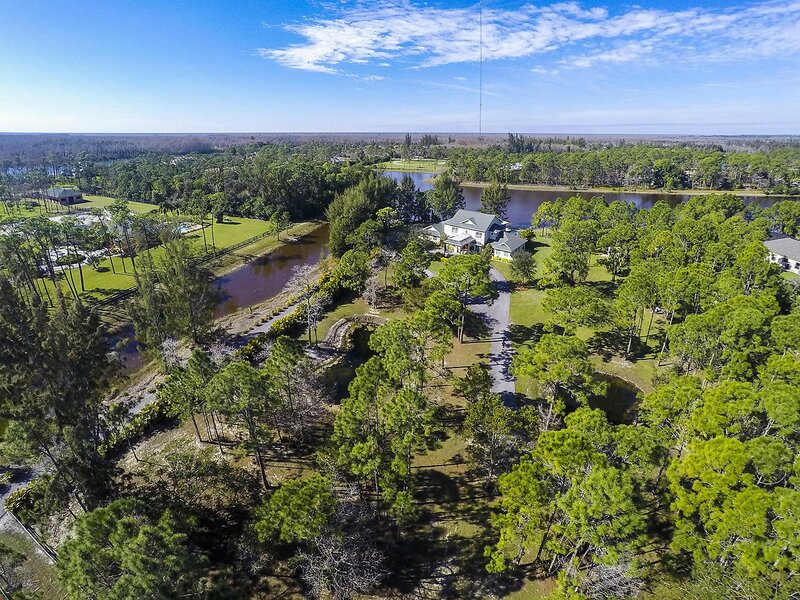 Elegant and renovated, with wide open views on 5 acres of land, inside the manned gated equestrian community of Homeland! 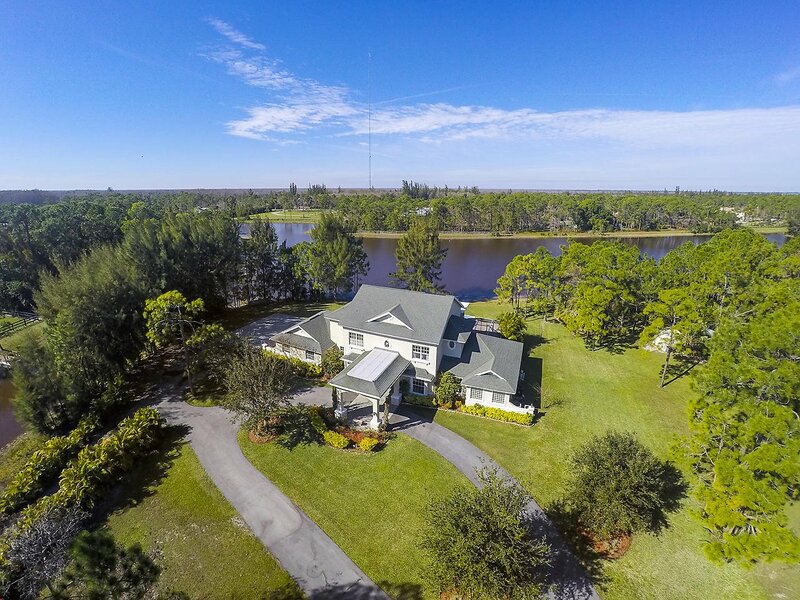 A 6 bedroom-plus loft/media room, 4.5 bathroom, 3 car garage home, with a resort style pool and water views will take your breath away. 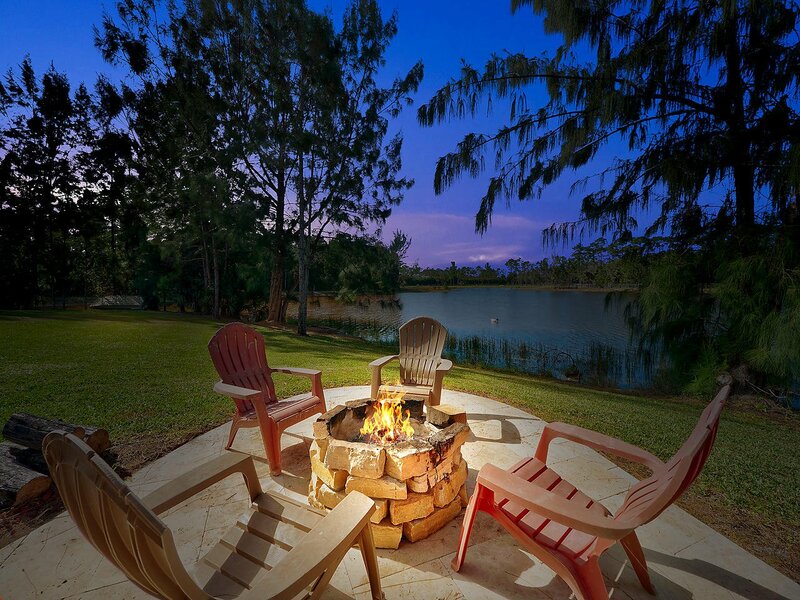 Admire the preserve-like feel and soothing sounds of nature. 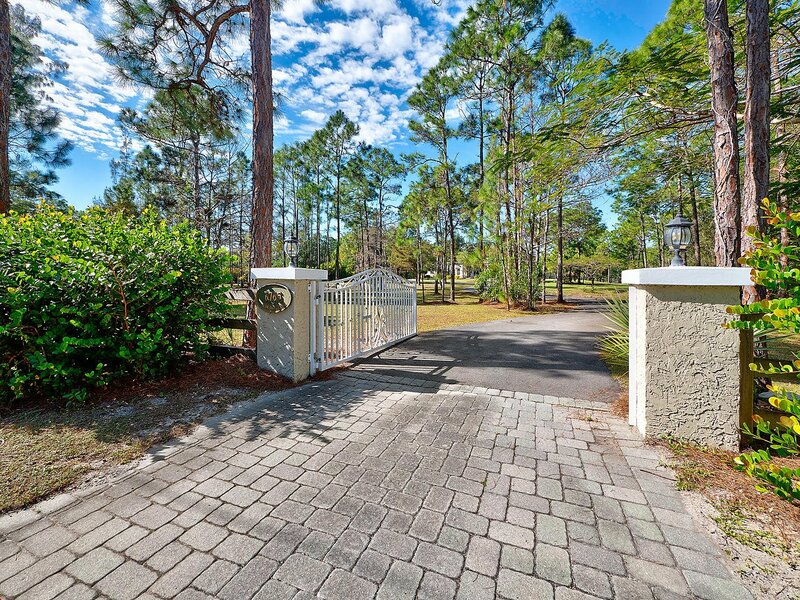 The entrance to the property features a gate with electric ,fenced in by a large dual circular driveway, meeting at an over sized separate/entry driveway to the 3 car garage. 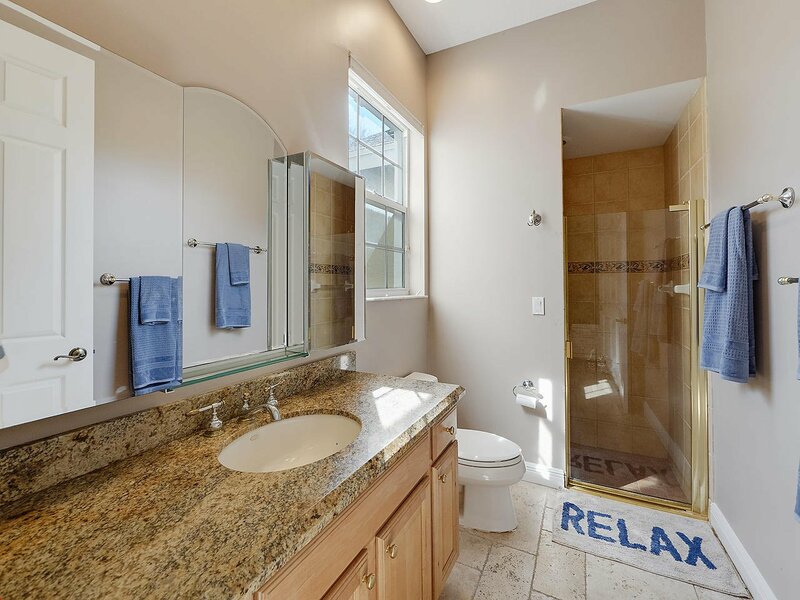 This home was completely painted. 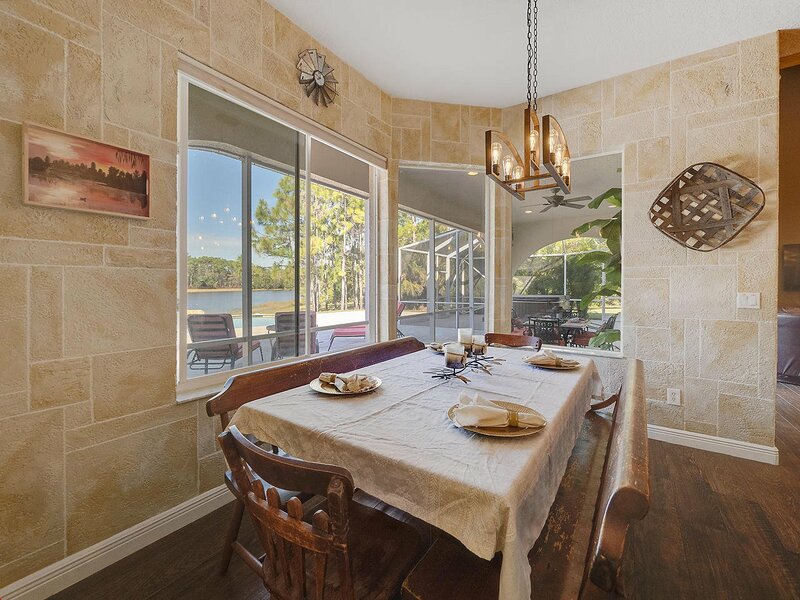 Inside, new travertine and wood tile floors are laid throughout the entire home. 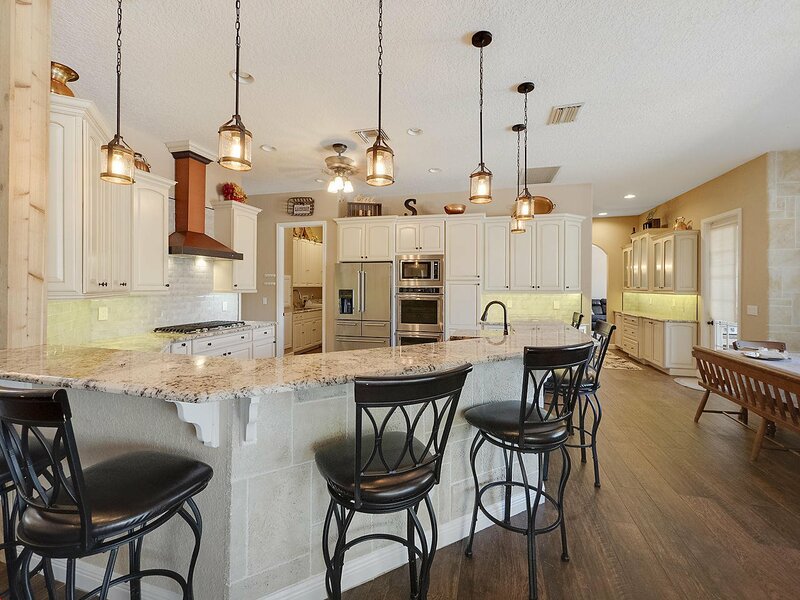 The kitchen was completely remodeled with wood cabinets, granite counter tops, back splash, a gas stove, high end stainless steel appliances, recessed and pendant lighting, double ovens , a stunning farmhouse copper sink and copper range hood are focal points in the kitchen. 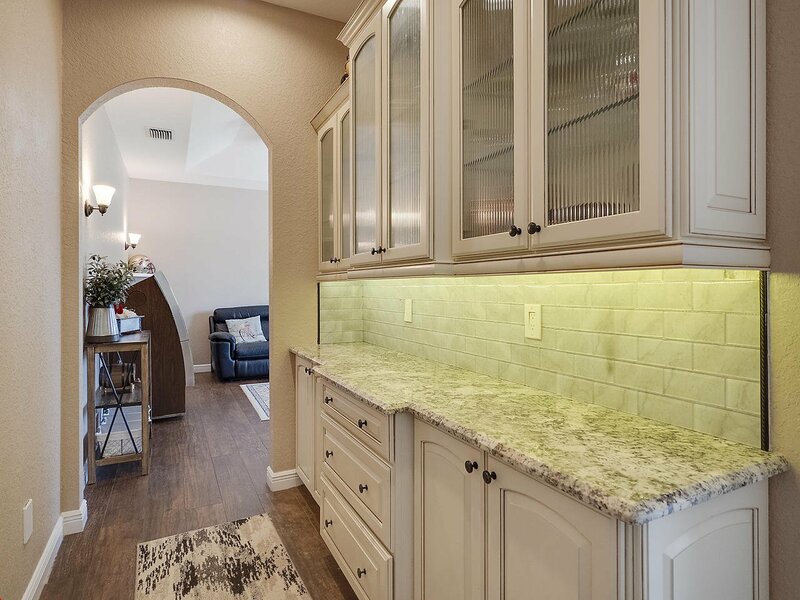 A new bar counter with cabinets and matching granite counter tops were installed in the kitchen hallway. 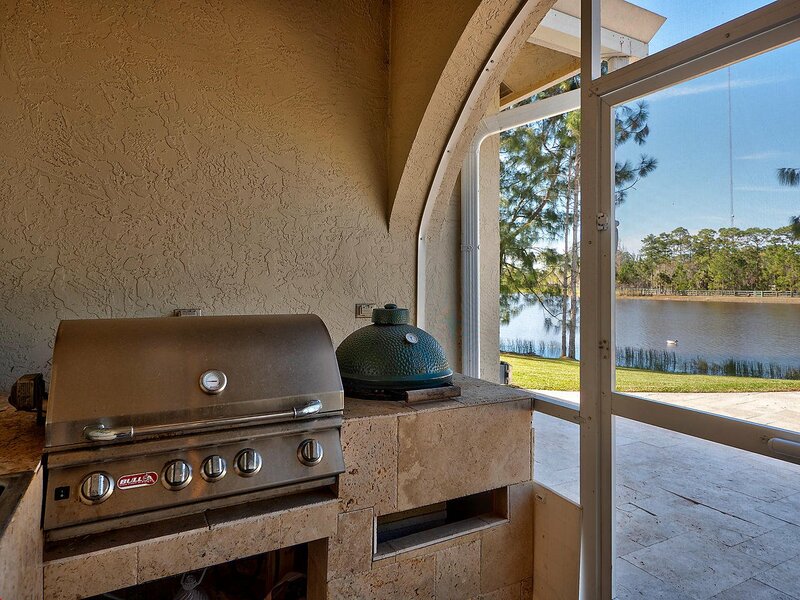 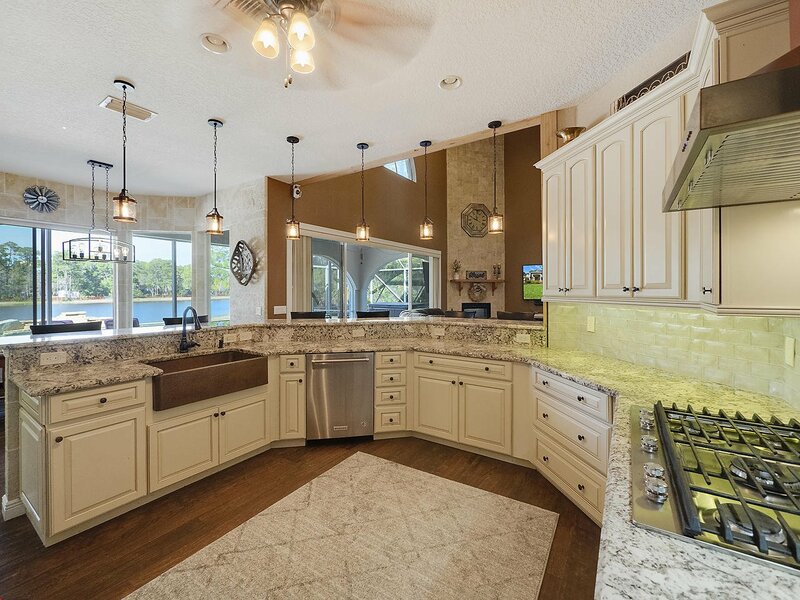 Spectacular lake views can be enjoyed while in the kitchen's breakfast area, through wall to wall large windows and sliders. 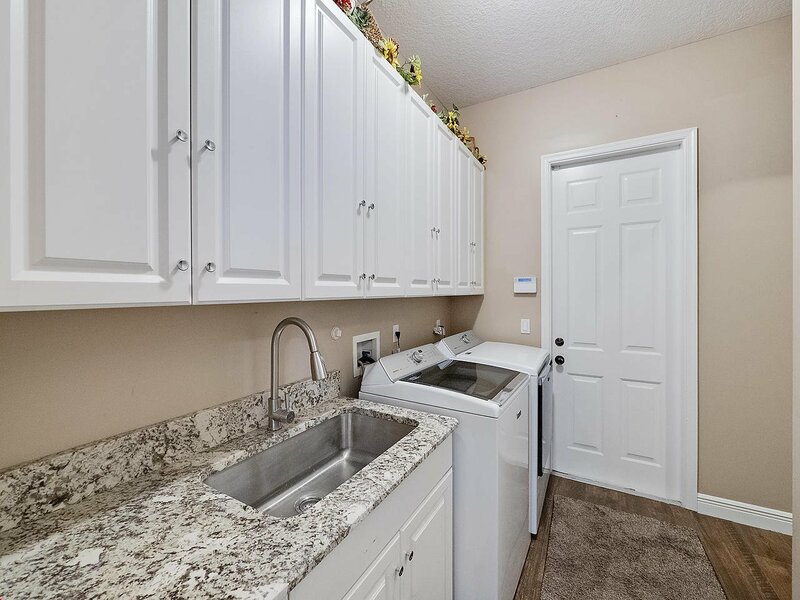 The laundry room features a newer model washer and dryer, storage cabinets, granite counter top, under mounted laundry sink, and access to the garage- which has epoxy coated floors and an extended paved driveway. 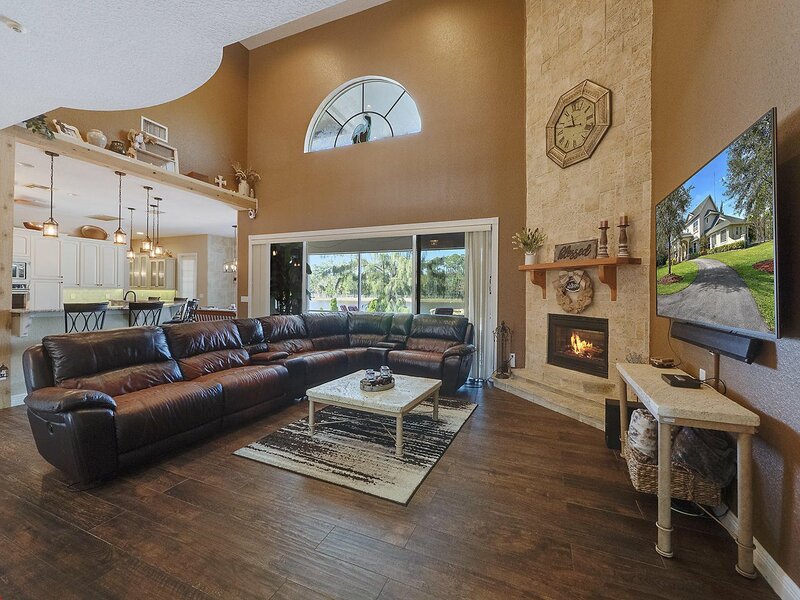 High volume ceilings with windows allow natural light in, and complement the ceiling-to-floor stone covered wall, showcasing an electric fireplace and rustic wooden mantel in the family room. 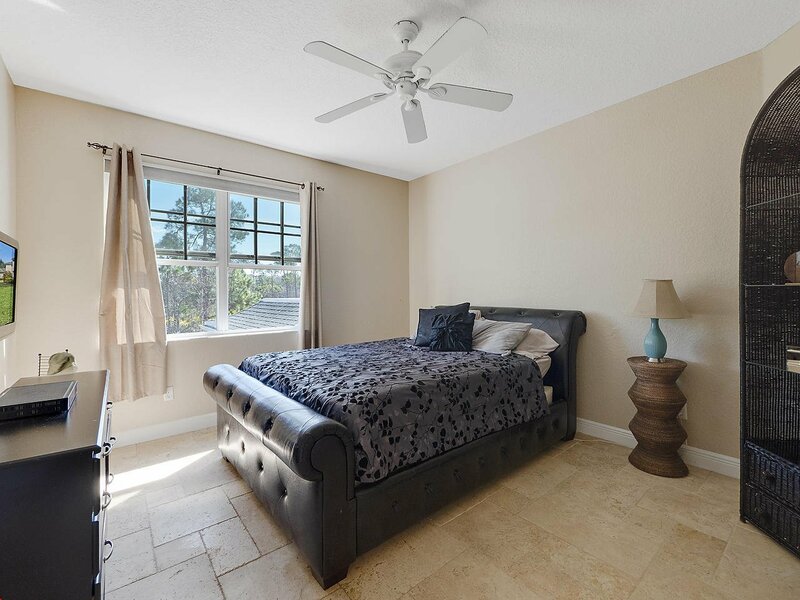 On the ground floor you will find one of two master bedrooms and bathrooms. 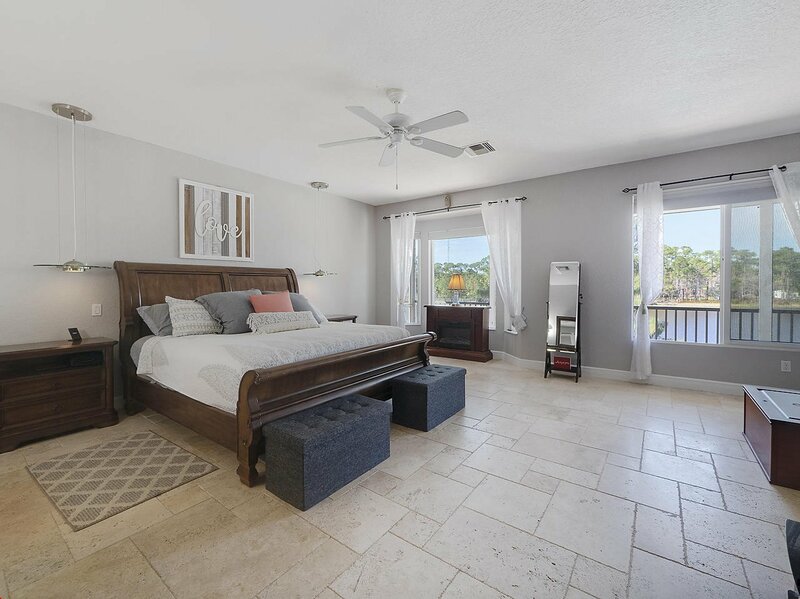 The master bedroom has 2 walk-in closets, a master bath with dual sinks, sitting vanity, tub, separate shower and privacy toilet/bidet. 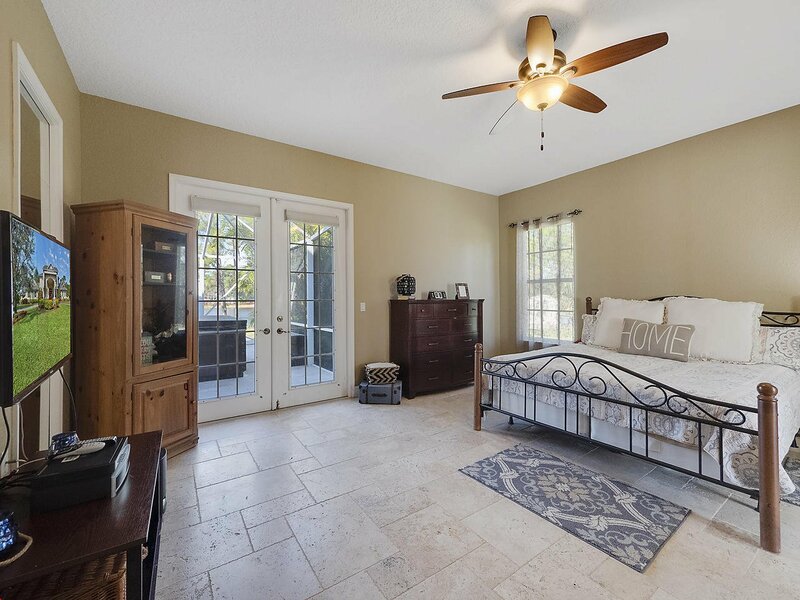 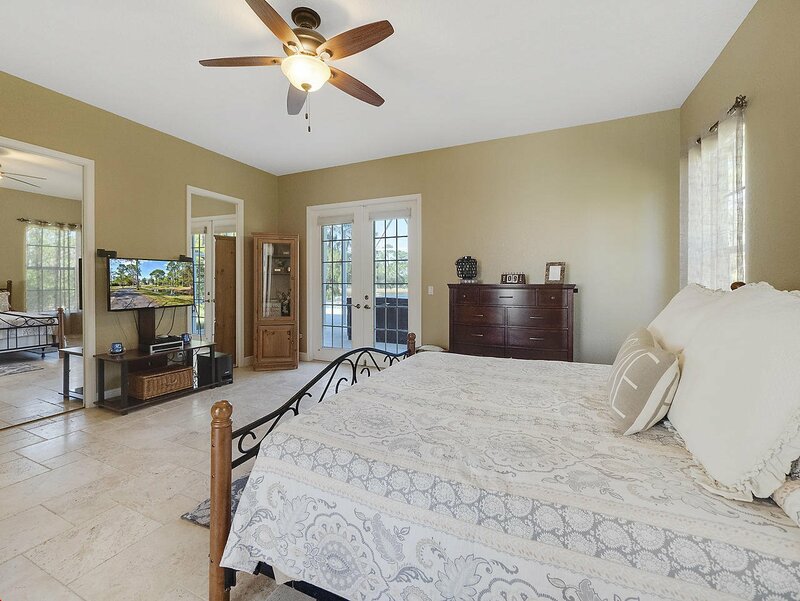 The master bedroom's french doors lead out to the screened in patio, beautiful resort style yard, pool and lake views. 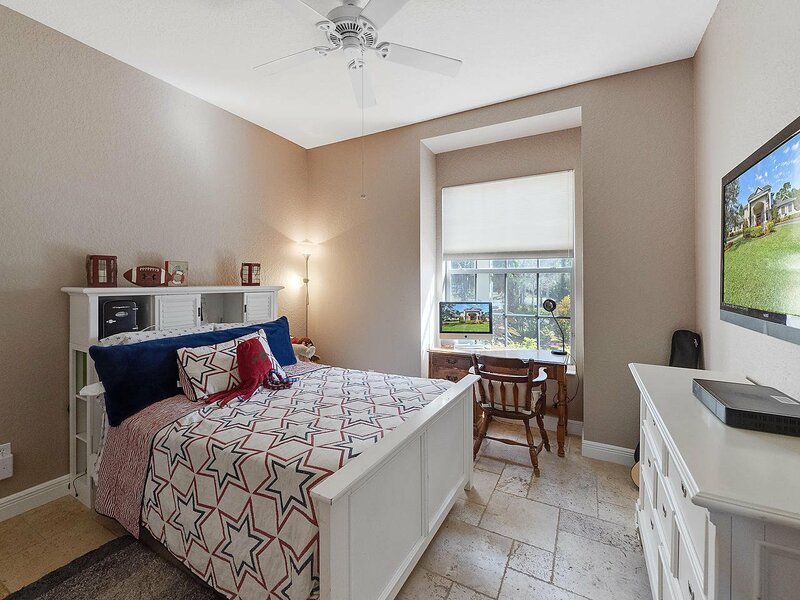 Also on the ground floor, is a mother-in-law suite/nanny bedroom with its own bathroom, a work out room with a closet, and a loft/media room, and a 1/2 bathroom. 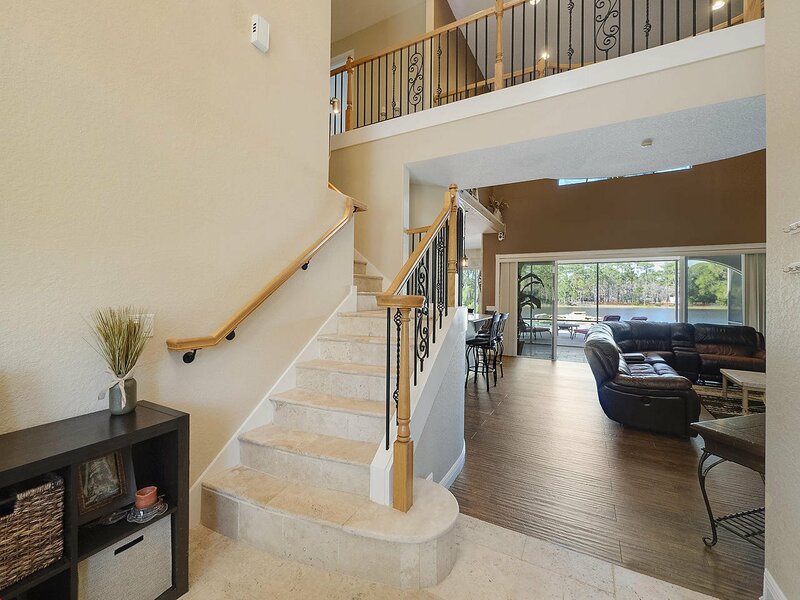 Gorgeous wood, travertine and iron stairs lead you up to the second level, where you will find 3 bedrooms. 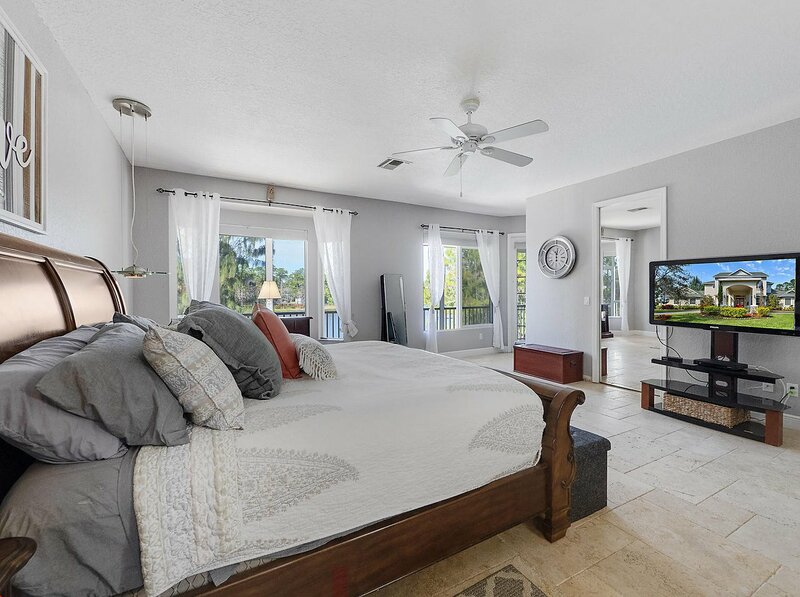 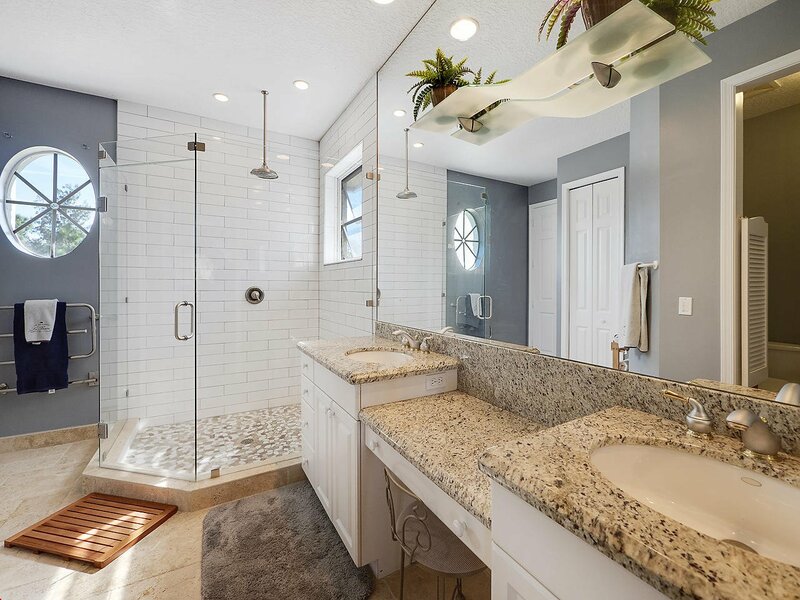 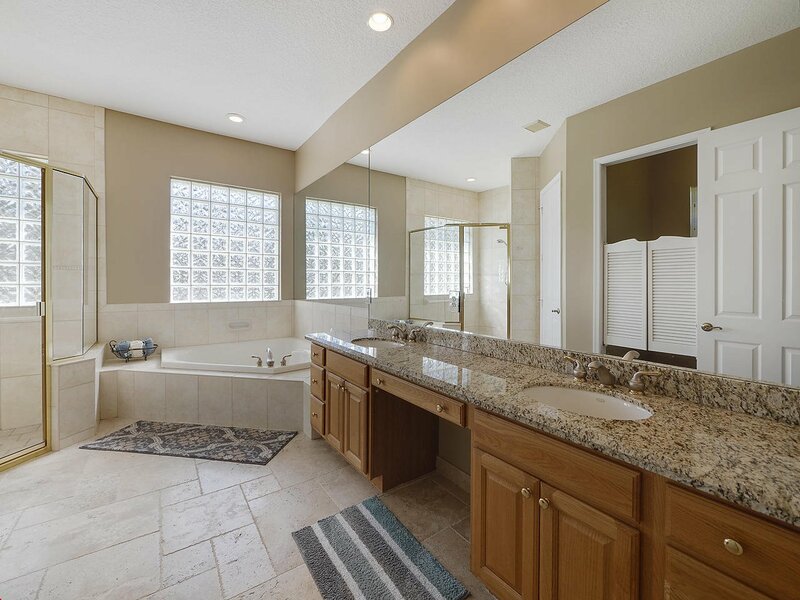 The second level master bedroom has 2 large walk-in closets, large windows,a completely renovated master bathroom with dual sinks, sitting vanity, huge shower with frame less glass doors,electric towel warmer, laundry chute to the downstairs and privacy toilet/bidet. 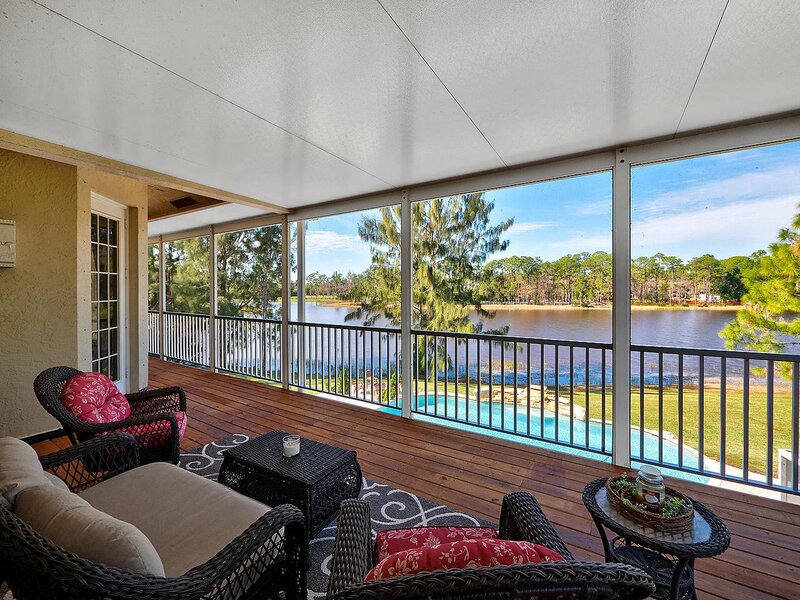 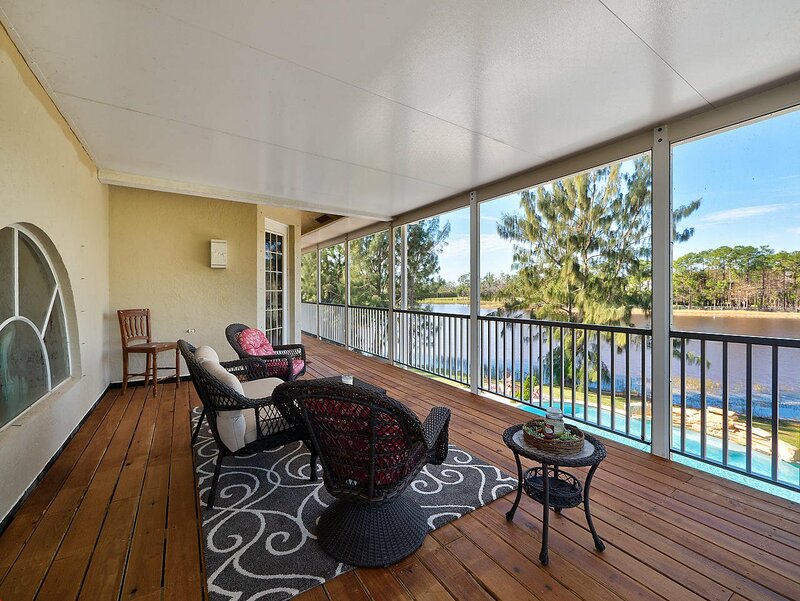 Enjoy more tranquil views from the master bedroom grand screened in balcony. 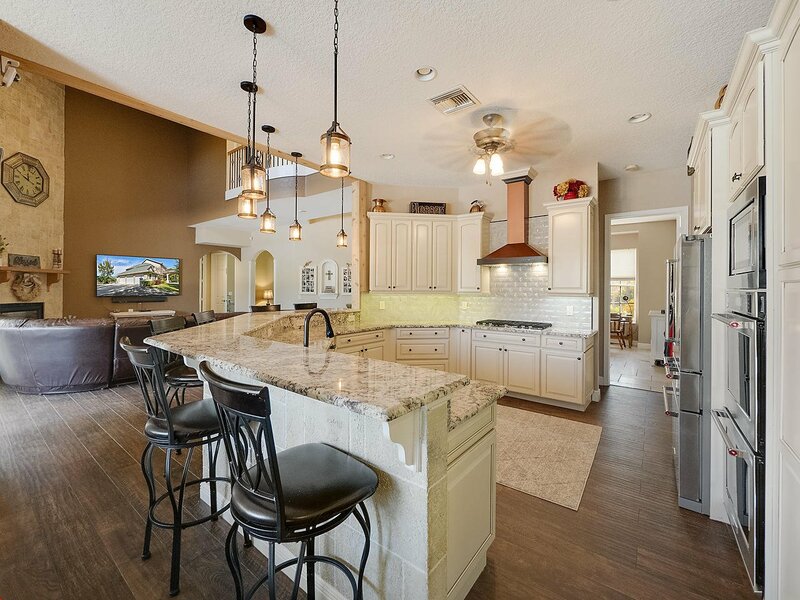 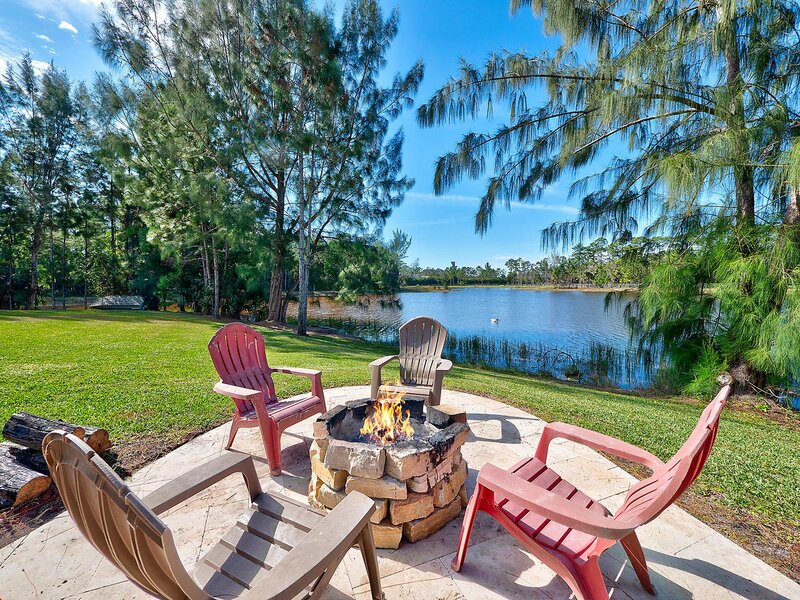 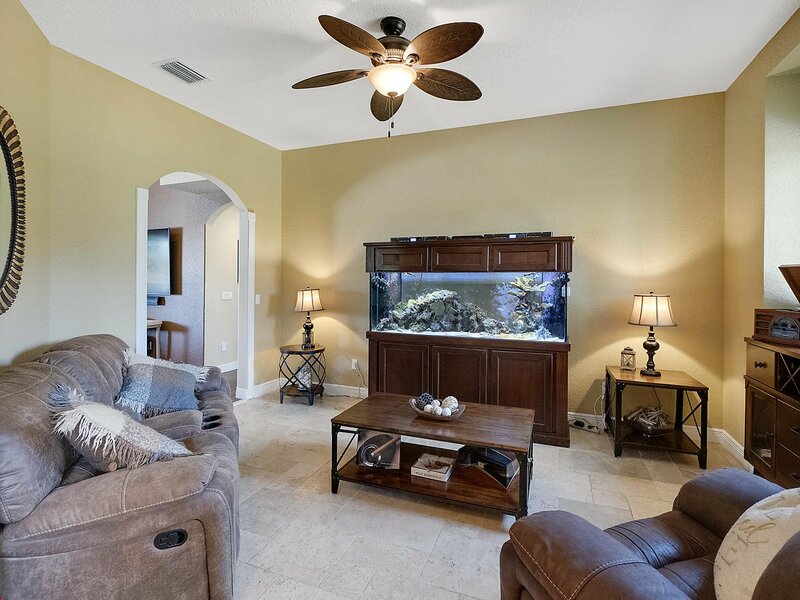 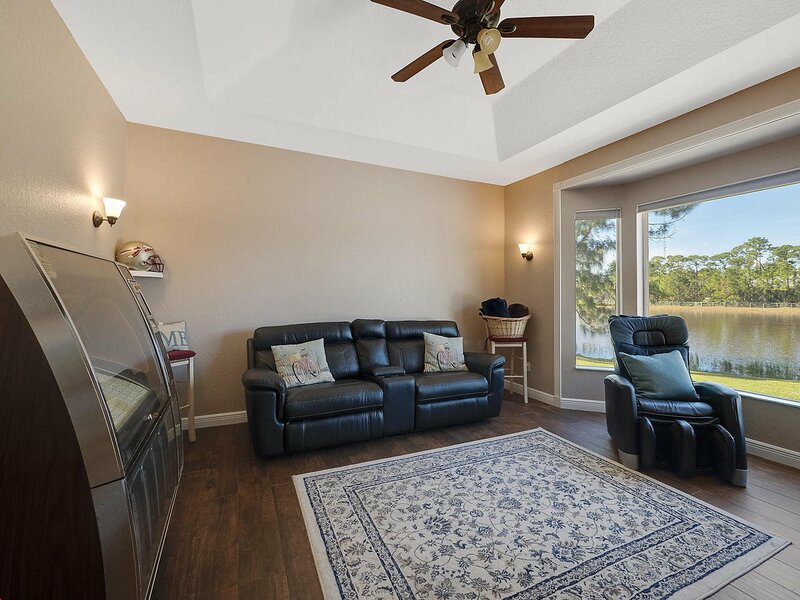 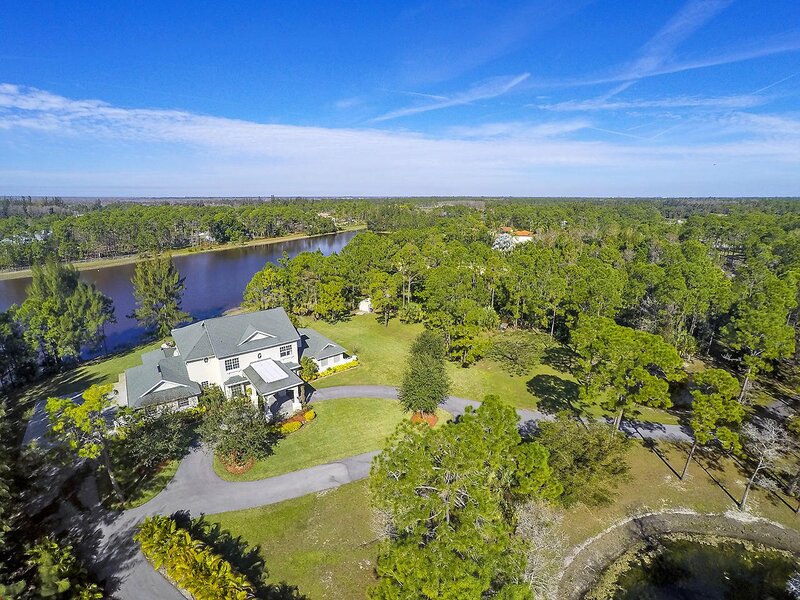 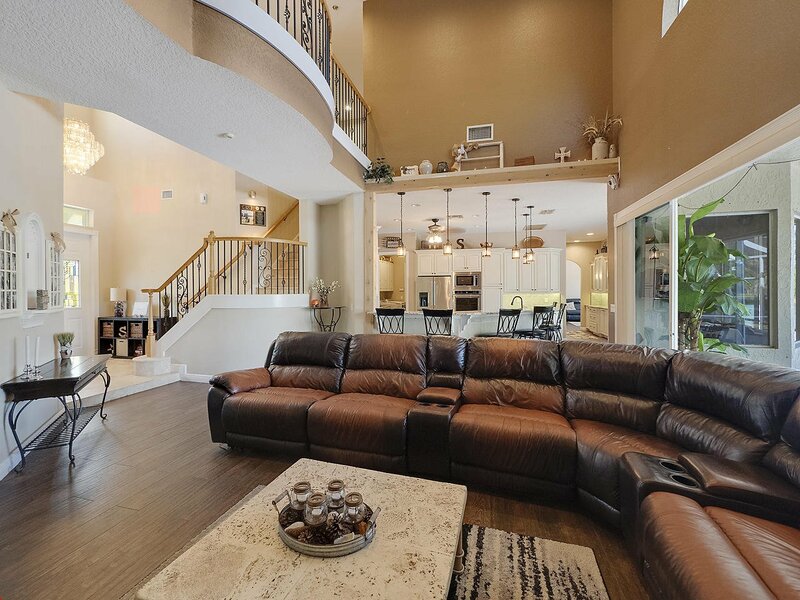 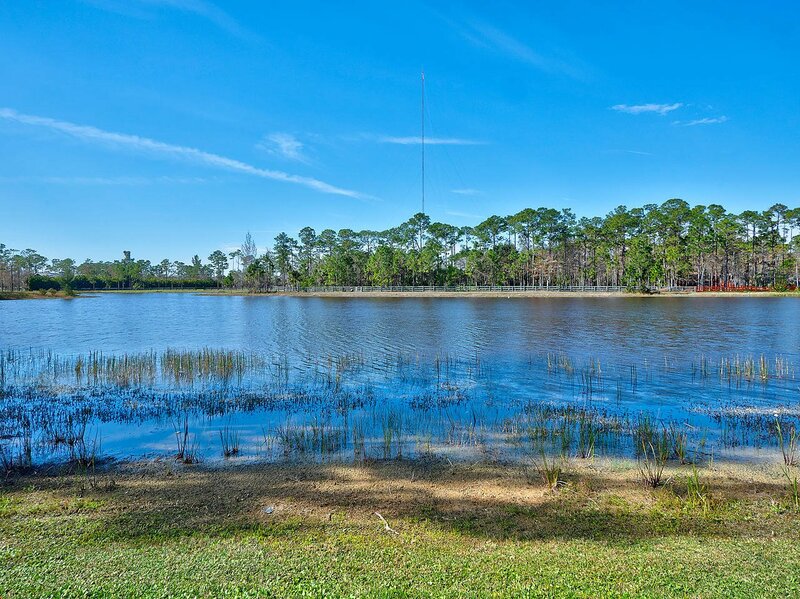 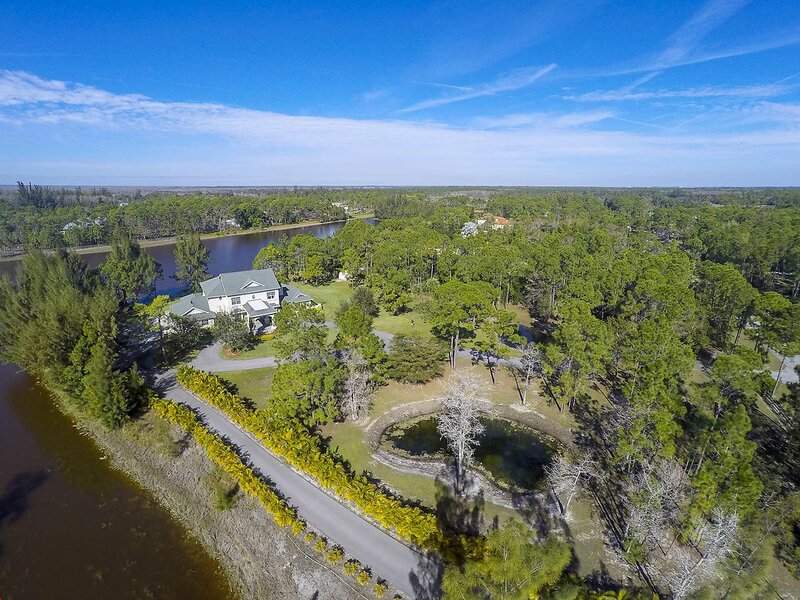 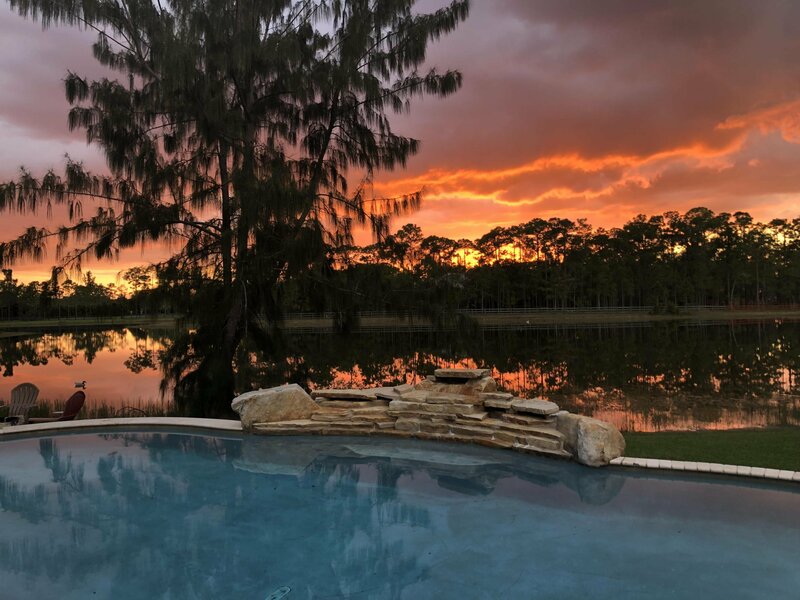 It is the perfect place to have your morning coffee, view Florida sunsets or read a book! 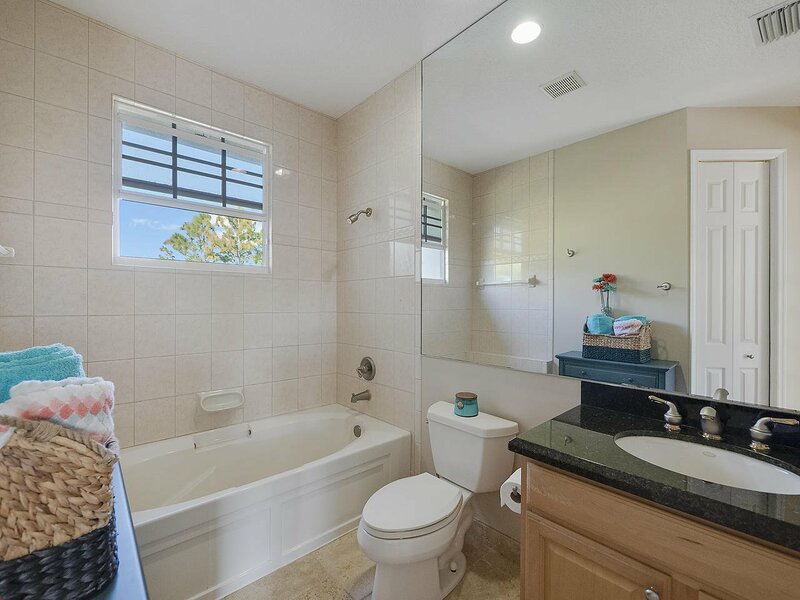 One bedroom upstairs has its own bathroom as well. 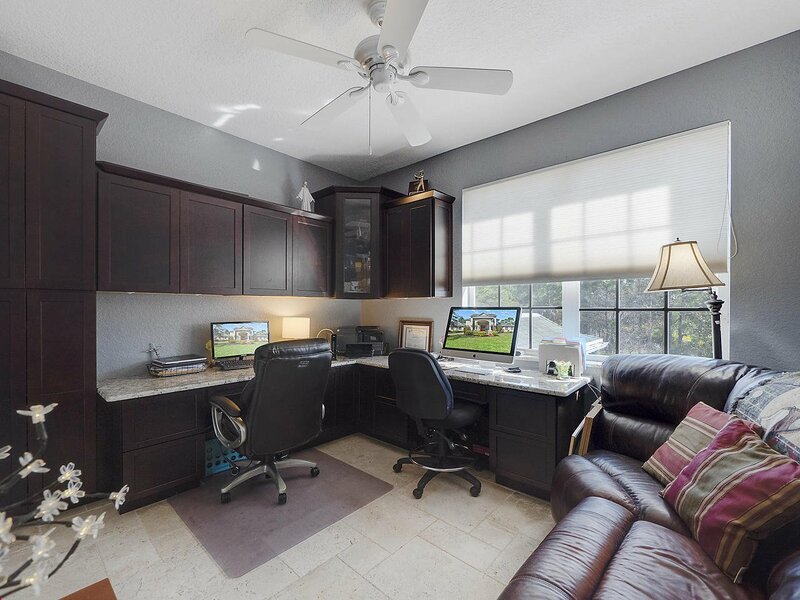 The other is used as an office with a closet, with a gorgeous built-in dual desk space and granite counter tops. 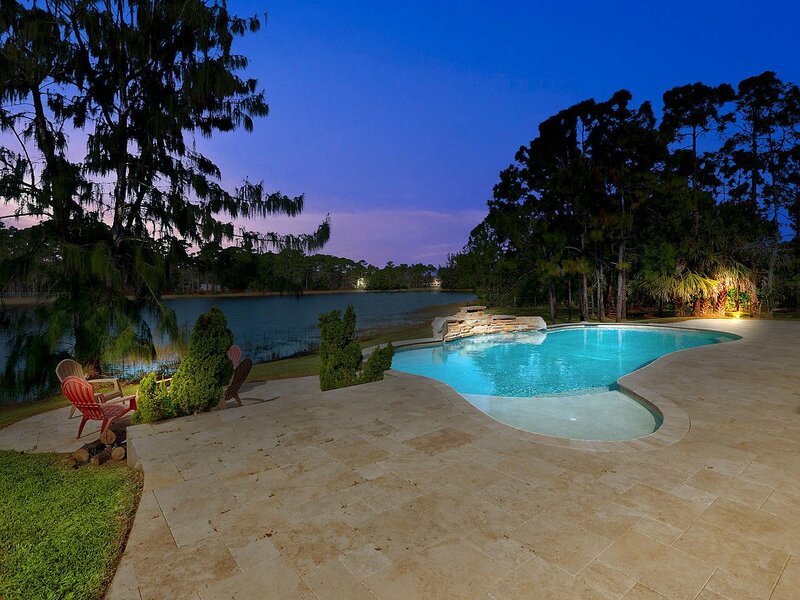 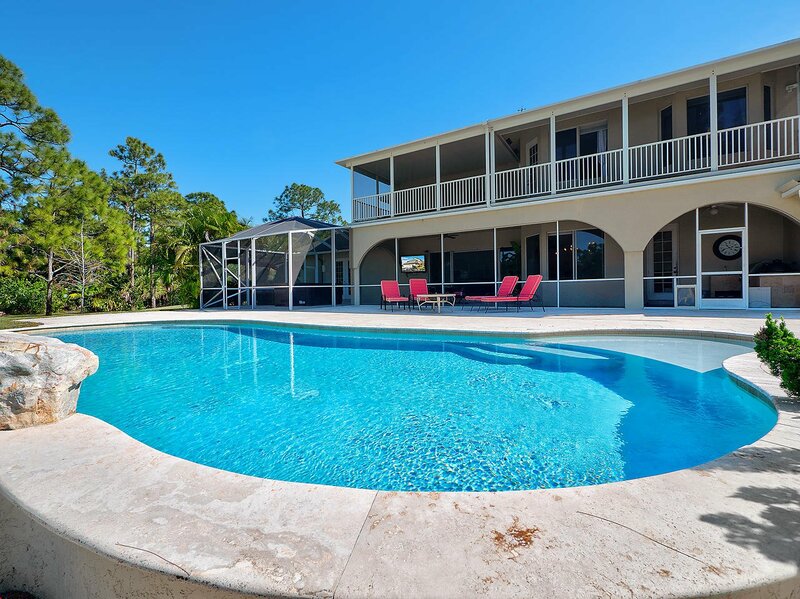 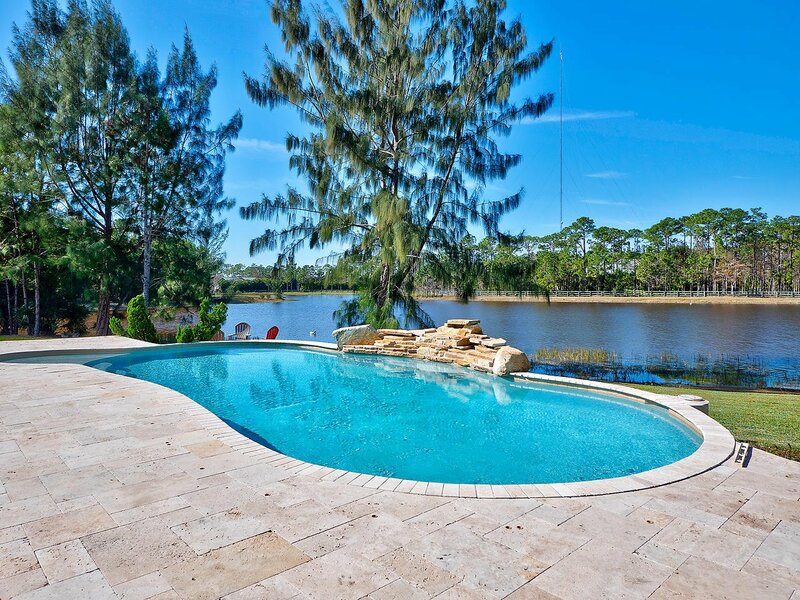 Outdoors, the BEAUTIFUL heated saltwater pool, travertine deck, fire pit and screens are all new. 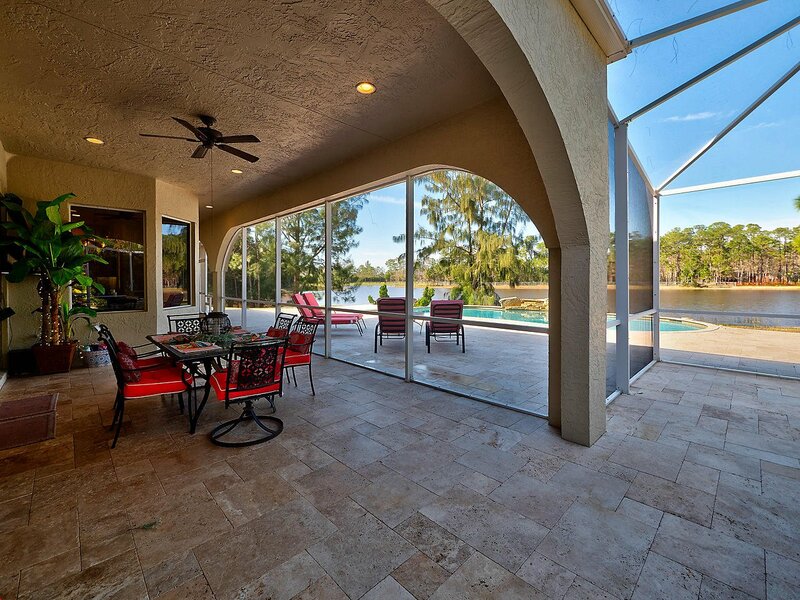 The extended screened patio is equipped with a jacuzzi, built in BBQ, Kamado grill, sink with running water, and gas hook up. 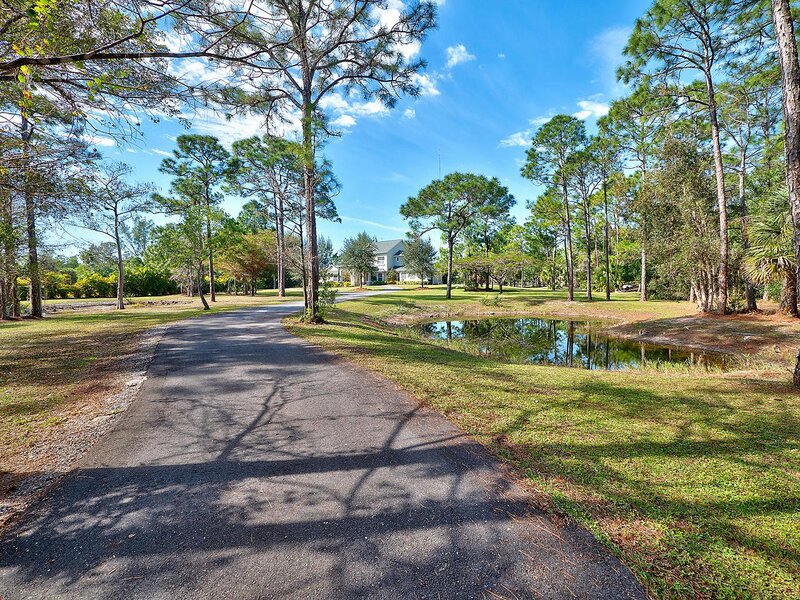 Water sprinklers are installed throughout the green areas, as well as a newer well and water softener. 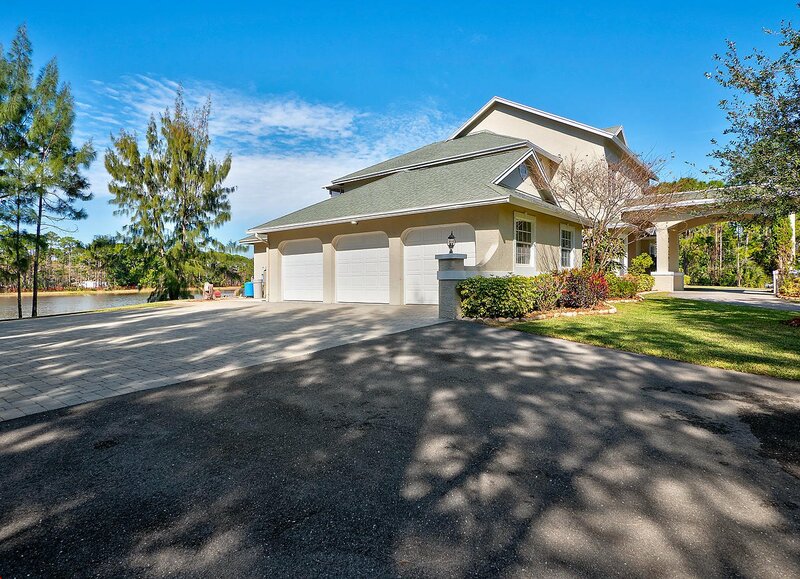 The spacious property offers enough room for a barn, stables and horses. 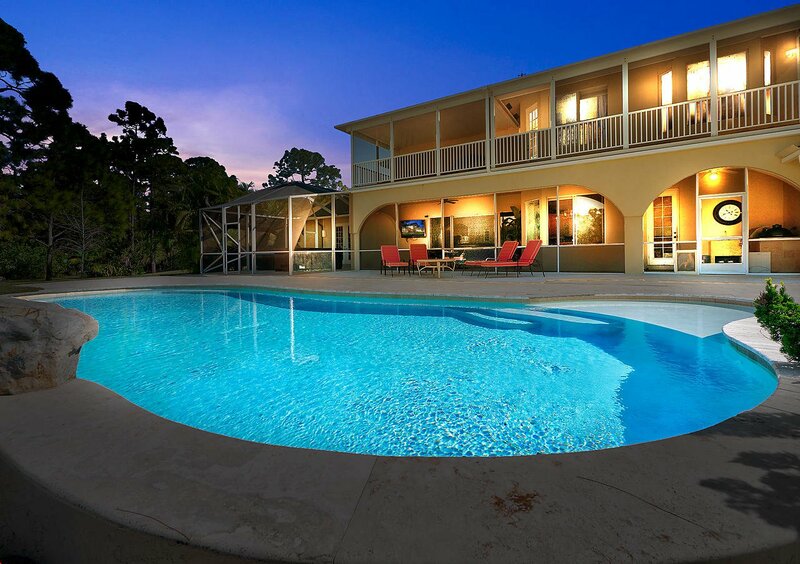 No exclusions on this home. 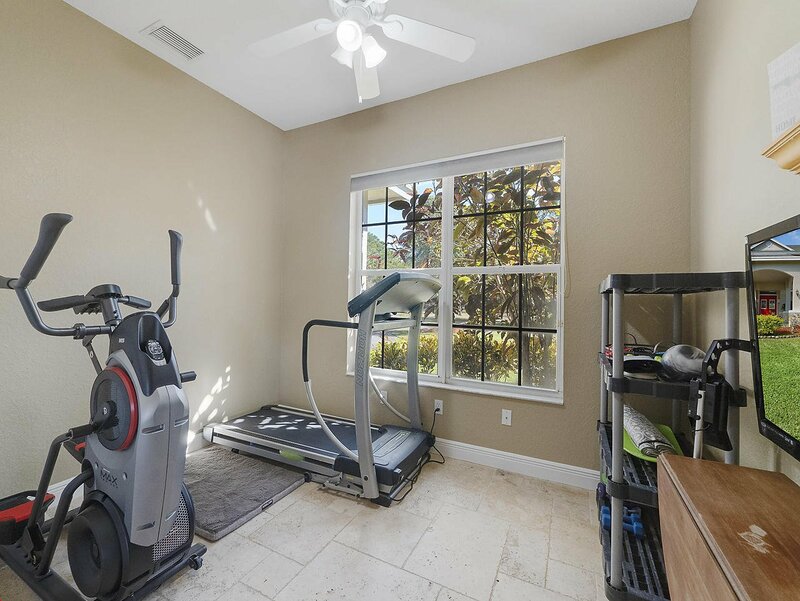 Other items included are 2 large dog cages and 2 refrigerators in the garage. 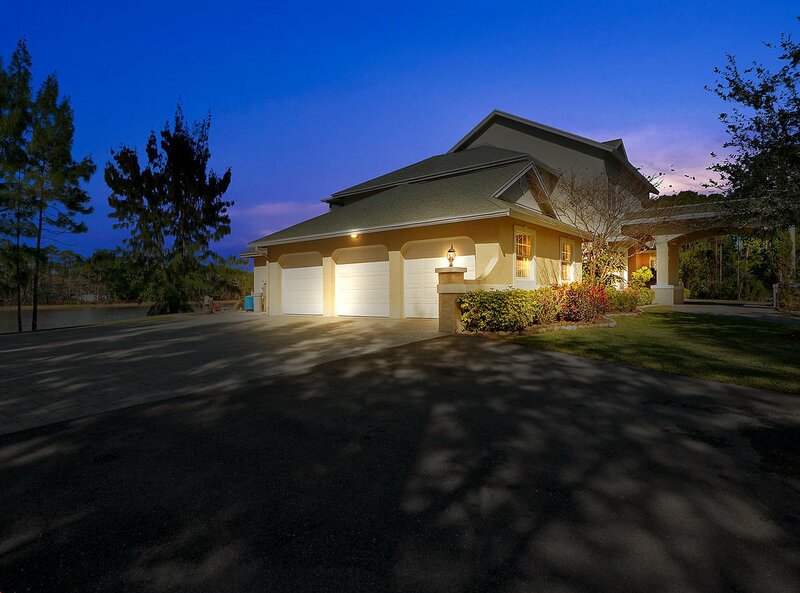 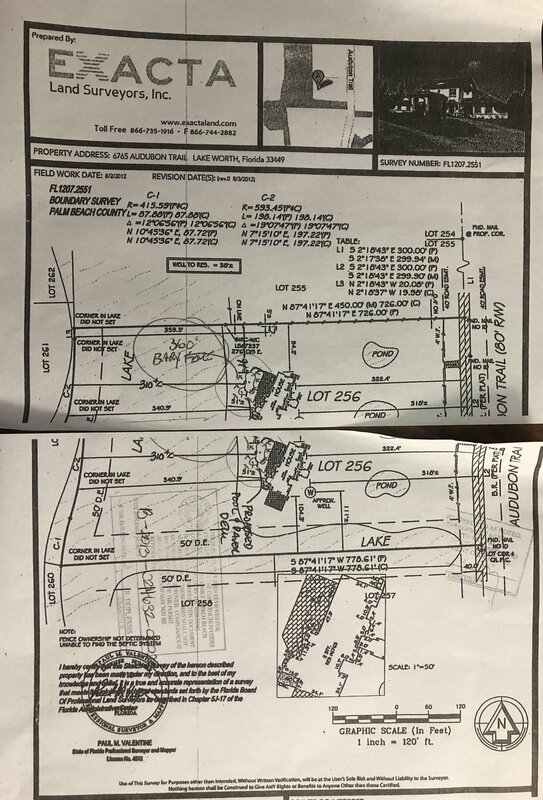 A house appraisal was completed and blueprints are also available. 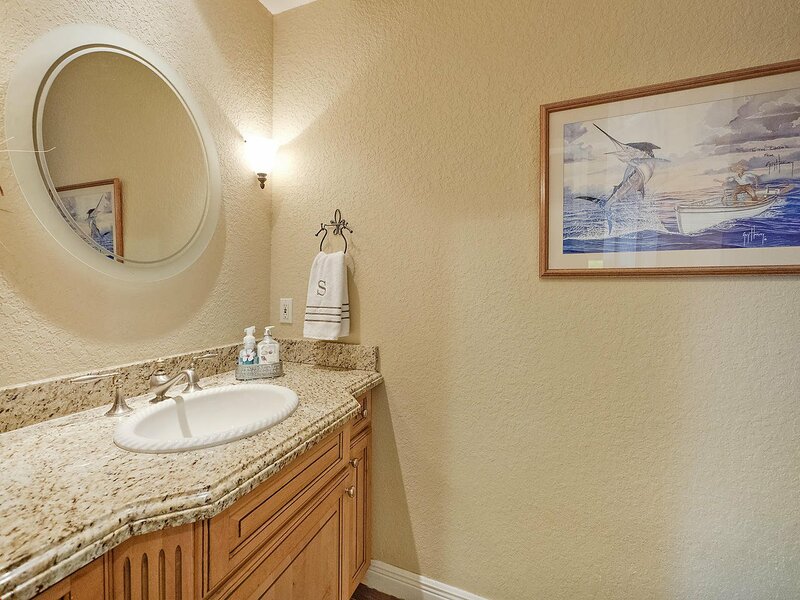 Don't forget to watch the virtual tour! 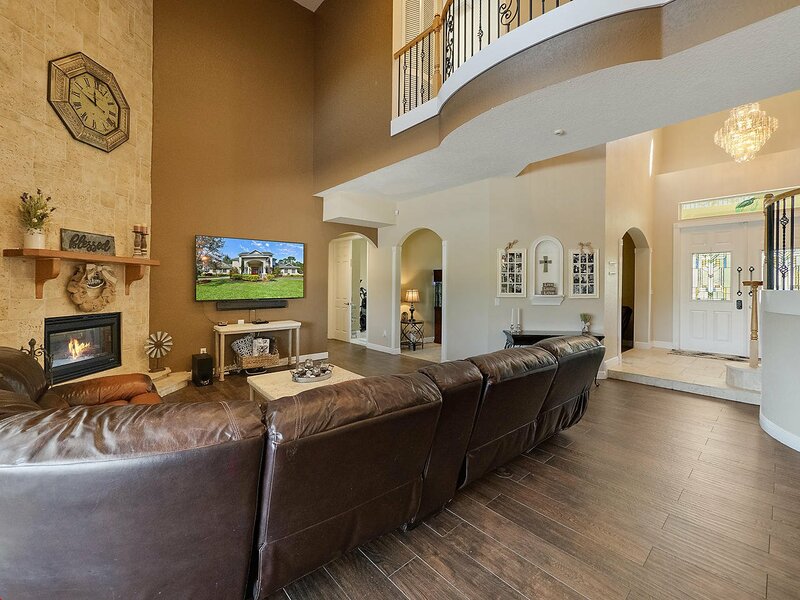 Schedule a showing of your dream home today!